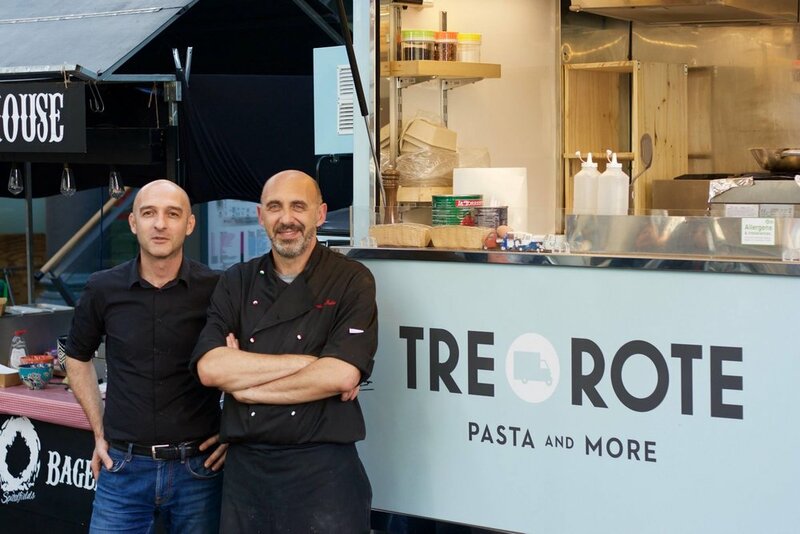 TRE ROTE was born from the passion of two Italian friends for quality ‘home made’ food; tasty and healthy dishes prepared with the best fresh and seasonal ingredients. Federico (from Naples) and Francesco (from Umbria) both have several years experience in the food business in Italy as Chef and Restaurant Manager. 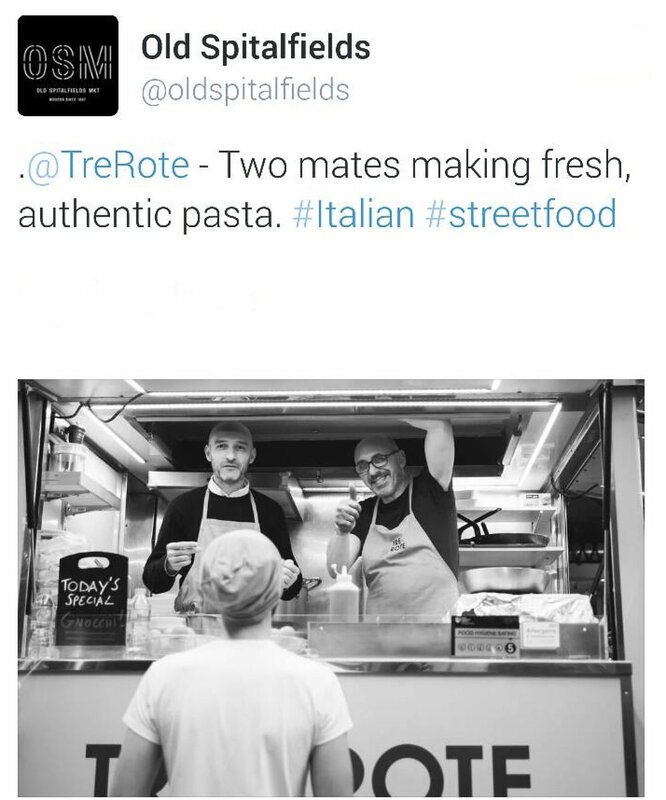 Having moved to London we decided we wanted people to discover the real taste of Italian street food. In particular we wanted to offer London a more traditional way of cooking pasta. Not the fresh handmade pasta, that is consumed in Italy only for special occasions, but quality durum wheat pasta, imported directly from Southern Italy where the best pasta factories produce it (e.g Gragnano in Naples). The aim is to cook the simple Italian pasta dishes that most Italians cook every day at home. 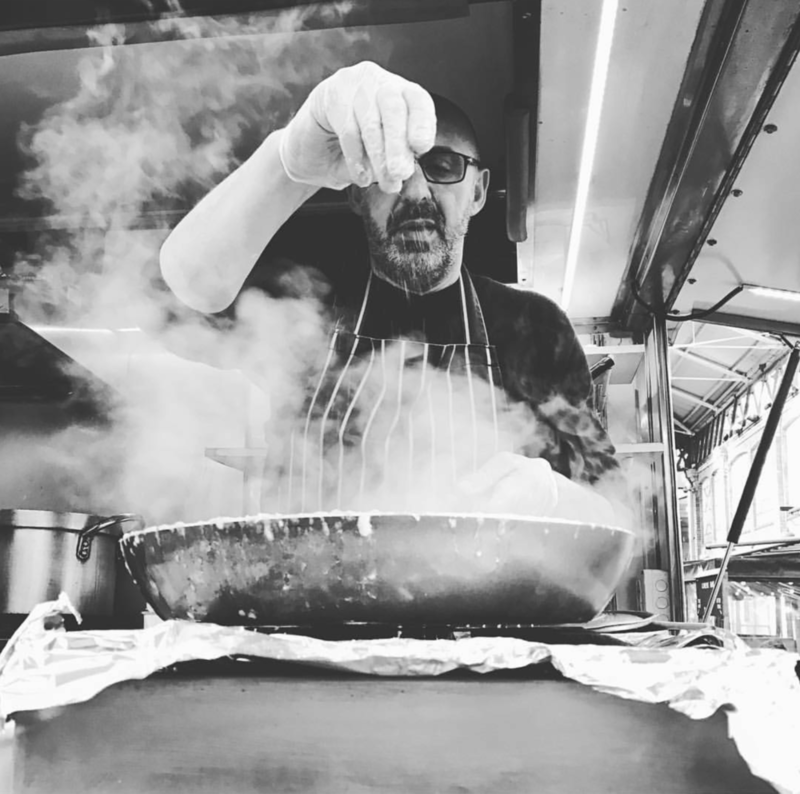 In Italy we have more than 300 shapes of pasta each to match different sauces and we think we can make a real difference offering this variety on our van. A traditional dish but with a touch of originality. The Ape Piaggio is our 'mobile kitchen', its unique design is more than 60 years old and it’s now an iconic symbol of the Italian tradition, with a modern edge. We regularly import basic ingredients from Italy, such as pasta, organic extra virgin olive oil, canned tomatoes and regional cheese (buffalo mozzarella included). For all other fresh ingredients such as eggs, vegetables, meat, fish and other types of cheese etc., we rely on local markets choosing Fair Trade, Organic, free range and seasonal products whenever possible. Each dish is prepared in front of the customer with fresh ingredients. We never use the microwave to reheat the pasta! top quality products, fresh and seasonal ingredients, simplicity and lots of Italian passion!